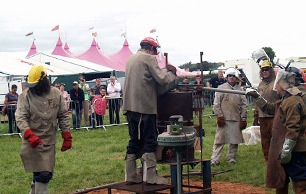 Matthew and Mike Davies were invited to run a furnace at The National Eisteddfod, Wrexham. Matthew has been invited as a guest artist to the Sculpture Department of the Herberger Institute for Design and the Arts, Arizona State University, Tempe, Phoenix. The result of a public commission from Torvaen C.B.C. 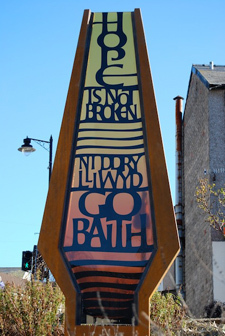 under the Heads of the Valleys Regeneration Scheme, letter-cutter Teucer Wilson, and Matthew, designed a work in corten steel and glass, incorporating the town motto. Every year, the Smithsonian Institute in Washington DC organizes an important event on the National Mall - the Smithsonian Folklife Festival - which celebrates the small-scale, local, traditional and oral culture of a particular country. Wales was the country featured in 2009. Matthew was one of the Welsh contingent - some 150 people from all walks of life - who spent a fortnight in Washington in June and July, representing and promoting Wales at the Festival. 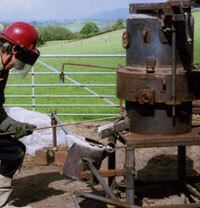 Matthew is showing work in cast iron and other metals, in a solo show at Llantarnam Grange, Cwmbran. Matthew's new, small cupola - built with financial assistance from the Arts Council of Wales - is now running successfully. 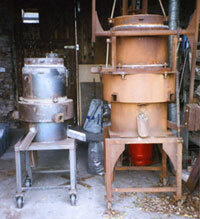 It can be operated easily by two people, and by one person if need be. Showing work with the Sculpture Cymru "Hiraeth" Exhibition, at The Gallery, Barry.